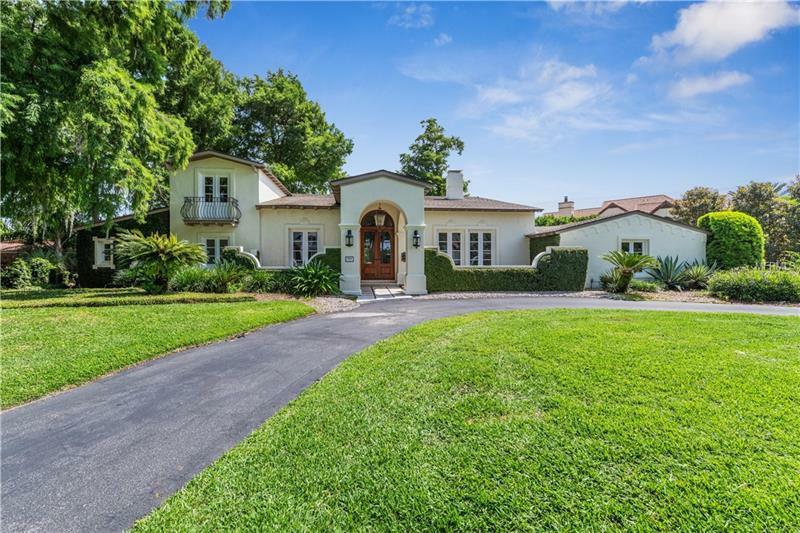 Tremendous character and charm throughout this stunning Santa Barbara-style Mediterranean resting on almost a 1-acre lot in the Vias. Waterfront estate size property on the Winter Park Chain of Lakes with boat dock and lift. This five-bedroom, three-and-a-half-bath residence enjoys a park-like backyard with pool, three-car garage, and has been extensively remodeled over the years. An open flexible floor plan, updated electrical and plumbing and enhancements provide flexibility for any interior styling. Fabulous entry to a vaulted wood beam grand room with gas fireplace and built-in serving cabinet. The home has 18-inch Travertine tile, plaster walls, built-ins, and extensive woodwork/moldings. The gourmet kitchen has a central island, breakfast bar, Miele espresso maker, steam oven, induction stove, Wolf double convection ovens, two dishwashers and Sub-Zero refrigerator. The downstairs Master retreat is spacious with spa bath & sitting area. The upstairs bedroom suites have French doors leading out to balconies overlooking the tropical pool area and waterfront. The gathering room has pocket sliding glass doors leading to a gorgeous brick patio/pool area and expansive lawn to enjoy family sports and entertainment. Perfectly located at the end of a quiet street in one of the most desirable neighborhoods in Winter Park convenient to parks, WPRC & ICC. Boat, kayak, paddleboard or ride your jet skis through the 6 lakes connected by beautiful canals and enjoy all that the lake lifestyle has to offer.